WebDAV is an extension of the HTTP protocol, which is the basic file-transfer method that makes up the Internet. Similarly to HTTP, WebDAV connects users to a web server so they can read, write, create, and edit files, as well as manage directories. The key advantage of WebDAV is the inclusion of properties such as author and modification time of a document in its metadata. This facilitates the WebDAV locking feature, sometimes referred to as DAV locking. WebDAV checks the last-modified times for a file to make sure that a new version hasn’t appeared since it was last opened. The locking feature blocks the write permission for everyone but the person currently editing a file. 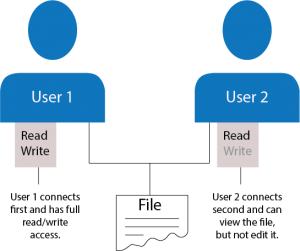 This feature prevents overwrite conflicts and dictates that a resource be occupied by only one user at a time. One user cannot overwrite another user’s edits; the person who opened the document first has the edit rights. Furthermore, WebDAV can display who last edited a file—useful information for administrators and support teams. The following features appear in the WebDrive administrator to allow you to customize your WebDAV experience. Keep in mind that DAV locking will only be available for WebDAV connections. Before you configure WebDrive to use DAV locking, check your cache mode (found in either the App Settings or Site Properties, on the Basic Cache Settings tab). You want to ensure your DAV connection is set to anything other than Single User. Single user connections assume that you are the only person who will be accessing files. Therefore, the files’ last-modified time is not checked against the server’s to make certain the file hasn’t been changed since you opened it. Single user mode also won’t register the lock status of the file, so if you and another person who is using multi-user mode have the same file open, you may save over the other person’s edits, even if they have the file locked. To enable DAV Locking in WebDrive, open your administrator and select a DAV site. Click the Site Properties menu button and select the DAV tab under General Settings. Select Enable Auto Dav Locking. It is wise to set a unique name in the Lock Owner Property, which will be different even from other devices you might also have WebDrive installed on. This prevents conflict errors if you try to edit a file under the same owner name from a separate device while the lock is still in place. You also have the option to select which types of files you would like to lock. If there are files you don’t need to cache, excluding them could save disk space. Also, this is where you can add proprietary file types commonly used in your enterprise, such as Adobe Creative Suite file extensions. On the Basic File Settings tab in the Site Properties window, select Enable Directory change notifiaction (at the bottom of the Basic File Options list). This setting notifies your remote server when changes have been made to a file, which will trigger an update to the cache, to keep the most up-to-date version of the file available at all times. You can temporarily disconnect WebDrive sites from their remote servers at any time and work on cached files. Your changes will be synced to the remote server as soon as you reconnect. Once your site is connected, you can right-click it from either the WebDrive administrator or the Task Manager icon. Select Go Offline from the context menu. To reconnect, do the same and select Go Online. You will only be able to access cached files when you’re offline, so it’s important to set the files you would like to cache beforehand. If you want all of your sites to have the same cache configuration, this can be set at the application level via App Settings. To give specific sites different settings, go into the Site Properties window and deselect Inherit global cache settings.